I’ve never been one to believe much in the magical powers of a calendar to bring about change but I must admit I’m looking forward to just that possibility when I wake tomorrow morning. Even though we’re due to start the year with a stinker of a heat wave I’m pinning quite a bit of hope on the idea that my run of misfortune will be stymied by the change of date. I shan’t bore you with the details of why this year has sucked but, because I can’t go a whole year without some kind of chart, will share a couple of images that demonstrate the impact of my non-reading life on the subject of this blog. 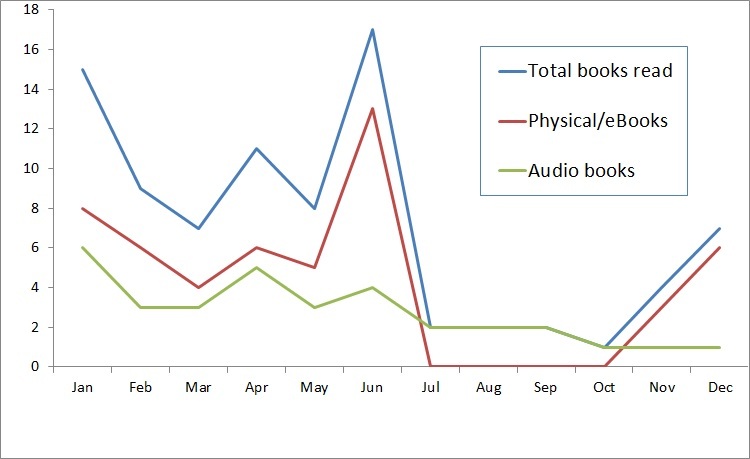 The above chart shows where this year’s reading falls in my reading history – the worst since my first full year of blogging about this subject in 2009. 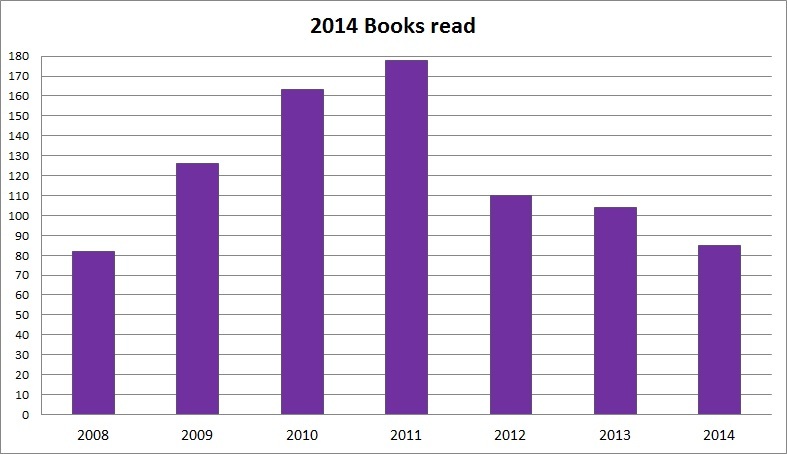 But the below chart tells an even clearer story, charting my reading over the year. After the mid-year burst to complete all the titles submitted for the competition I was a judge for, I’ve barely read a word for the last half of the year. But I’ll take solace from the fact that the chart does end on an upswing. 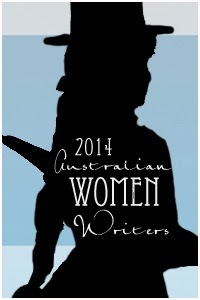 I did manage to achieve the highest level of Australian Women Writers challenge which requires reading and reviewing 10 books (I read 18 books and reviewed 12 this year) but didn’t beat my personal goal of surpassing last year’s total of 20 books read and reviewed. I shall be returning as a participant and co-host for this challenge in 2015 (you can sign up too). I have done woefully on the Reading USA Fiction Challenge. This requires the reading of 50 books – one for each state of the union – and I have read a total of three! I have actually read more American novels than this during the year but my personal slant for this challenge is that the book must be set in the relevant state and the author must be new to me. I’ll keep going with this challenge in 2015…and beyond (you can join in too). 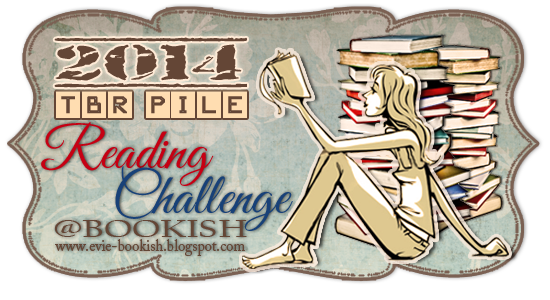 I planned to read 31-40 books that I owned prior to the start of 2014 and managed only 19 so the TBR Pile Reading Challenge was a failure for me. I don’t think I’ll sign up for a specific challenge on this front on 2015 but I do hope to do better on working through books I already own. Not really a challenge but…I did meet my goal to only buy books from Australian stores – though to be totally honest I didn’t buy many books even there – only 6! But at least my discretionary spending in this area has all been local! Hope 2014 was a better year for you all than it was for me and wishing you good fortune, and good reading, for 2015. This entry was posted in books of the year. Bookmark the permalink. Very sorry to hear what a year it’s been for you, Bernadette. I can only imagine how glad you are to see the back of it. Wishing you a much better 2015. Thanks Margot. Hope 2015 is a fabulous year for you too. 2014 wasn’t stellar for me either, Bernadette. I can’t even decide which was worse, the summer or the fall – they’re kind of tied in my mind. I’ve been really looking forward to the new year. It’s funny how much of an impact the non-reading life can have on one’s reading. I didn’t join any challenges for 2014 but if I had, I would have failed them all! Hope next year is a much better one for you too Belle. I am looking forward to your daily blogs and hearing about the changes you’ve hinted at. Thank you so much for your ongoing role in the AWW challenge, Bernadette, and for your reviews. Hope you have a much better time of it in 2015! Thanks Angela. Happy New Year to you and the family too. Stay cool. I am looking forward to a much better 2015 also. Some events in my life seriously impacted my energy level, although I did not find it affected my reading. Hope everything goes better for you in 2015. Best wishes for the new year, Bernadette. I hope it’s a brighter and shinier one for you. Thanks Amanda. And thanks for your wonderful novel…a definite highlight of my reading year (even with the tears). A very happy New Year to you Bernadette. Big hugs. Thanks Jose Ignacio. Happy New Year to you too. Hope yours is cooler than ours…43C here this afternoon! Happy new year. Thanks for keeping your blog going – let the good times roll. Indeed Sue. Bring on the good times for us all. Sorry to hear about your bad 2014, Bernadette. It wasn’t a great one for me either, although in my case reading was my only refuge (to the detriment of just about everything else). I hope 2015 rings in plenty of positive changes for you! Hope 2015 is a better year for you – in both reading and non-reading lives! Here is to a better new year for you and all of the commenters on this blog. For some reason, I’ve read less than in each of the last several years. Am tireder and I’ haven’t found too many compelling books, with a few exceptions. And I’m forcing myself to read books I should probably give up on. While the usual advice is to give a book 50 pages to decide whether to continue or not, a friend told me at a New Year’s Eve party that’s for those under 50. For those over 50, deduct one’s age from 100, and the number remaining is how many pages one should give a book before giving up. I read about half the number or less than I’ve read in past years and my reading rate is slowing down. I hope you find great books this year and that everything improves for you. I like the logic of that equation Kathy – definitely going to be using that one. The obvious question is: What book is it? Let me join the chorus of people wishing you well this year, and let me add that I like your charts. If I get a snowstorm or a lull, I may do some charts myself, but it’s not looking likely. I don’t know, maybe the quantitative stuff isn’t so important: you had a good batch of “best reads,” regardless of the small reading totals! And it looks like 2015 will be great for you too Sarah…what with your first novel being published and all. How exciting.